Goocha is a modern chic seafood restaurant that is worth a visit if you're looking for palatable seafood with appetizing side dishes. Goocha has mainly a typical Israeli seafood menu, but its sauces and cooking are quite different and unique. For example, you can have seafood mix topped with coconut milk, curry and coriander sauce, or shrimps cooked with ginger and honey. 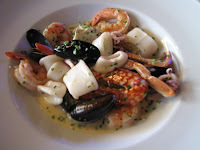 Besides seafood they also have pastas, delicious gnocchi, entrecote, hamburg er and chicken. Don't miss out on the yummy appetizers, of which the green papaya salad is highly recommended. The only flaw of the place is that the desserts are a bit too simple. The tarte tatin is one of the better ones. The Dizengoff branch has a terras where it's nice to sit outside in the summer and watch the passing dogs and owners on the boulevard in front. 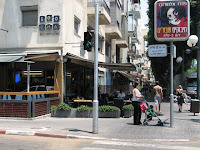 There's also a terrace at the Iben Gvirol branch, but it doesn't have the nice touch and feel of the Dizengoff branch. Sunday to Thursday, 12:00-16:00, you can have a business meal that offers one appetizer and soft drink for 10 NIS (with a main dish). Go north on Dizengoff until you hit the intersection with Ben Gurion and you are there. For the branch on Iben Gvirol you go on Dizengoff (when the Dizengoff square is on your back) until you reach Iben Gvirol, then cross the road and take right.